Digiplexis – A New Plant To Try! This year there are a couple of new plants I’m excited about. This is the first one…and one that we’ll have available for you to try this spring. 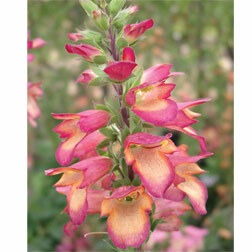 Digiplexis is a cross between digitalis (foxglove) and Isoplexis canariensis (Canary Island foxglove). The picture is courtesy of breeder Thompson & Morgan, since I haven’t grown it yet. If it looks anything like this, though, I’ll be taking plenty of pictures in my own garden! The result of this cross has taken the horticultural world by storm – a breathtaking (by all accounts) combination of the orangeish-apricot flowers of isoplexis with the pinks of foxglove. The variety is called ‘Illumination Flame” and won the Greenhouse Growers’ Award of Excellence in 2013. In fact, this cross was thought to be impossible but was accomplished by Charles Valin after 6 years of work. The flower spikes are similar in shape to foxglove, and the 3′ tall plant is reported to have multiple bloom spikes. This is our first growing season with this plant, and it will be a learning experience for us all. I am hoping that, because of the heat loving isoplexis genes, it will last longer into the summer for us. It would be best to site it in a spot that receives some afternoon shade to ensure it lasts as long as possible. The plant is sterile, so it won’t seed; but reportedly the bees and butterflies are still atracted to it. And, even though the tag claims it is a perennial, I will be labeling it an annual until it proves itself as carrying through an entire summer and winter here. A word to the wise : Any of you reading this who are regular customers are aware of how quickly we sell through things during the height of spring. If you are interested in trying some of these, please let us know so we can special order them as they become available. In addition to Illumination ‘Flame’, we’ll also be carrying one called ‘Raspberry’ later in the season. This was an addition to a local grower’s order that was unexpected, so, of course, we’ll have to try it as well! This entry was posted in Annuals, Perennials and tagged digiplexis, digiplexis flame, digiplexis raspberry, foxglove, isoplexis, new foxglove cross on March 25, 2014 by Kris Blevons.